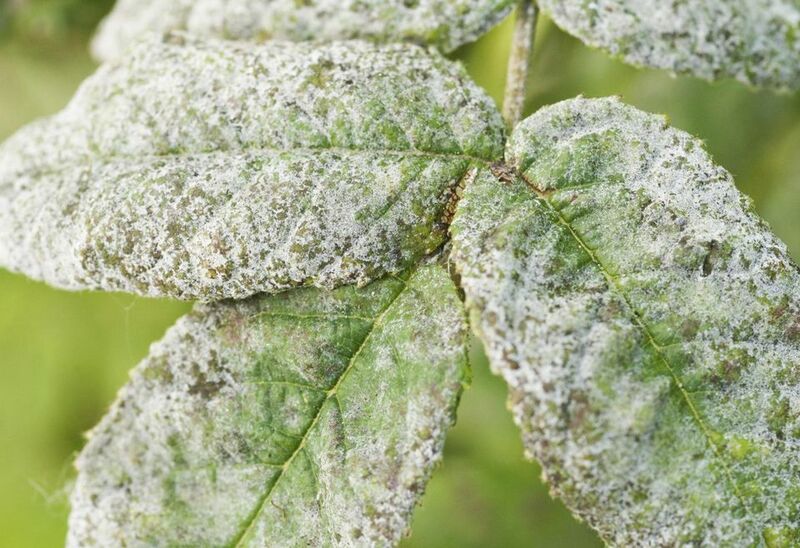 Powdery mildew is one of the most common and easily recognized plant diseases. It is a group of fungal diseases that are prevalent in warm, wet weather. Almost no type of plant is immune, however, some are more susceptible than others. Lilacs, crab apples, phlox, monarda, roses, grapes, squash, and cucumbers are all likely targets for powdery mildew. As the name implies, powdery mildew looks like powdery splotches of white or gray, that appear on the leaves and stems of plants. There are actually several types of powdery mildew fungi, but they all look basically the same on your plants. You may not notice a problem until the top surfaces of the leaves turn powdery, but powdery mildew often starts on the undersides of leaves and can also take hold on the stems, flowers, buds, and even the fruit. Although powdery mildew is unattractive, it is rarely fatal. However, it does stress the plant and severe or repetitive infections will weaken the plant and stressed plants are more prone to other diseases and insect damage. Additionally, if enough of the leaf surface becomes covered with powdery mildew, photosynthesis is impaired. Infected leaves will often fall prematurely. This can be a particular problem on edible plants because insufficient photosynthesis can diminish the number of sugars produced and affect the flavor of the fruit or vegetable. If buds become infected before the flowers are even allowed to open, the plants may not bloom or set fruit at all. Although powdery mildew affects a great number of plants, the different powdery mildew fungi are host specific, meaning each of the powdery mildew fungi infects only specific plants. So the powdery mildew on your lilacs will not spread to your grapes or your roses. However all powdery mildews favor the same weather conditions. Periods of dampness or high humidity. Powdery mildew is less common during prolonged rainy seasons and in extreme heat. Crowded plantings where the air circulation is poor and the plants remain wet. The spores are also able to spread faster when they appear in clumps of their host plant. Choose healthy plants and keep them growing healthy. Stressed plants are an invitation to disease. Don't let your plants become stressed from drought or other poor growing conditions. Try to find a powdery mildew-resistant cultivar. This is especially important if you garden in n area that is known to be susceptible to an annual attack of powdery mildew. Don't plant non-resistant varieties in the shade where they might remain damp and offer the spores an ideal place to grow. Removing and destroying all infected plants This is the ideal solution, but it is not very practical and few gardeners are willing to sacrifice their peonies or squash every time there is a powdery mildew outbreak. luckily there are some less drastic measures you can take. Improve air circulation by thinning and pruning. Don't fertilize the affected plants until the problem is corrected. Powdery mildew favors young, succulent growth. Try not to water plants from above. This will spread the spores. Of course, there is not much you can do about this if it rains.